The Bulrushes, a Unique Home Stays property. I arrived at The Bulrushes to meet the owners on the most beautiful summers day, the garden was in full bloom and the sun was beaming in through the windows. I could see this was a very special location that simply needed an injection of colour and texture inspired by the natural surroundings. The Bulrushes, dining area with natural rug and greenery a plenty. I took my inspiration for the re-design of the living space from the leat outside and the bulrushes that run along the edge. The abstract artwork on the wall behind the tan leather chair is my representation of the bulrushes and the sisal rug is also a take on these natural elements. I chose the big boucle weave with a deeper hue. As the living space is so large, I wanted to create a subtle divide and interest between the living and dining area. I did this by sourcing a gorgeous reclaimed work bench and placing totally oversized, zingy lamps by Pooky on top. The colour scheme of multihued greens and blues act as a representation of the elements and the foliage found in the natural environment that blankets the home and of course the beautiful lavish gardens of Trerice Manor which sits closeby. 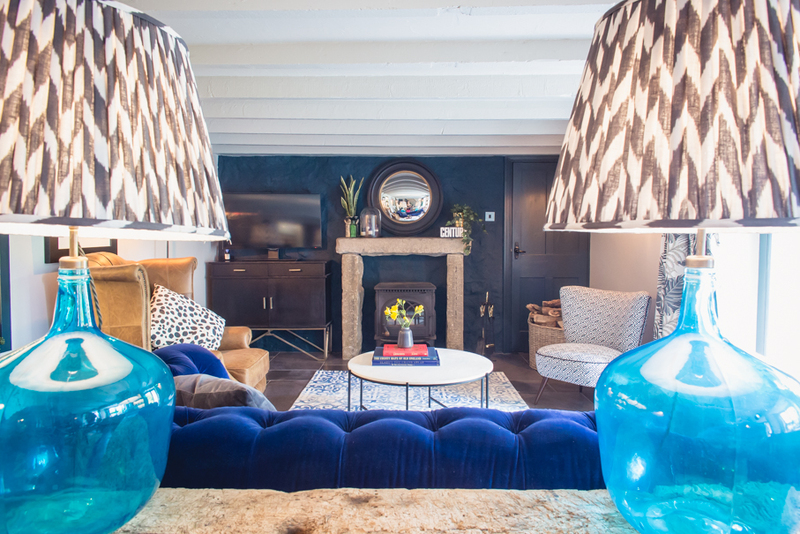 I intensified these hues, using reflective and two-toned textures such as the sapphire blue velvet and blown-glass lamps, to give the room a special jewel-like quality. The master bedroom with its more bohemian style reveals a subtle blush pink inspired by the blossoming courtyard. When I first stepped foot into The Bulrushes (formerly The Old Flour Mill) my eyes were immediately drawn along the ten-meter space towards the end of the room. Here I sourced the biggest blocks of reclaimed Cornish granite that I could find and created a focal point. 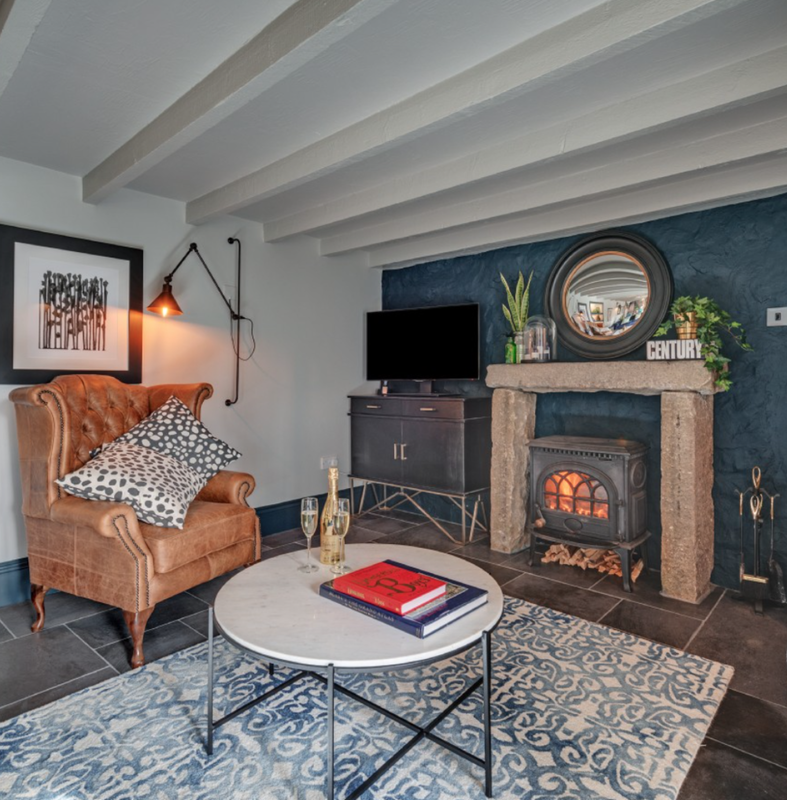 The curb stone surround looks as though it could have been there since the cottage was first built and now there is something fabulous to look at as you walk into the room, a great place to display treasured possessions and a quirky mirror. Best of all, the stone acts like a huge radiator when the fire is lit, creating a really cosy room. The Bulrushes was a pleasure to work on, I'm always amazed how changing core elements like flooring and focal points can change a space so dramatically. Could you switch to the Dark Side? In recent months a shift has been noticed in the leading edge of the design scene which is starting to filter down to us mere mortals. It’s a shift from white bright and light colour schems to more intimate, cozy and darker schemes. Theses schemes are wonderful in winter months with all the added embelishments that flicker and glow, candles, fires, glitter balls, if it takes your fancy. But I do wonder will these schemes be so appealing in the summer months. Or should one’s home have a less conventional and slightly feverish flow where by there are areas that lend themselves more to summer living, perhaps where the patio doors lead out to the garden as can be seen below in the wonderful Cowboy Kates eclectic home. Kate's styling is spot on with her layered flooring and sumptuous green foliage and baskets. This (above) beautifully styled corner of a room by Jazzierere confirms that dark coloured walls dressed with bright pops of colour such as this delicious velvet yellow chair produces an overall bright and interesting vista. The look is completed with an eclectic collection of bright, monochrome and textured vases, flowers, foliage and artwork. Sheepskin rugs add an easy throw on winter accessory to sink into and add yet more layers to the look. The above, now iconic, dark interior by Graham Atkins-Hughes shows how beautifully the blues, greens and greys meld together. Particularly impressive is the bravery on embracing the dark side by painting the cornice moulding, ceiling walls and floors in the same deep dark colour which leaves the fireplace and statement lighting to really talk for itself. If you want to try a bit of the dark side but don't want to commit 100% this beautiful bedroom designed by Jess Clark for Unique Home Stays is a great way to try out the dark trend without looking as if you weren't feeling brave enough. It works particularly well on unusual shaped walls, alcoves or walls where there is already an object, such as a fireplace, breaking it up. The artwork, blankets and rugs bring a zingy pop to the room once again proving that dark doesn't have to be too dark. So, the beautiful inky dark hues seen in this article actually give the space more presence through their beautiful depth of colour thus creating a more generous room. What do you say- could you make the move over to the dark side?